I've been meaning to post some fun wordless picture books for a while, but I keep finding more that I like! They work well for young readers/listeners a number of reasons-- firstly, with the bulk of the storytelling resting on the images, all the illustrations will immediately draw in little ones' attention. You don't have to worry about reading level, as you can add as many or as few words to the story as you like. You can even make your child "read" the story to you. Another option I've enjoyed with my five-year-old is having him tell the story on one page, then I'll tell the story on the next page. Most of these are from our local library. 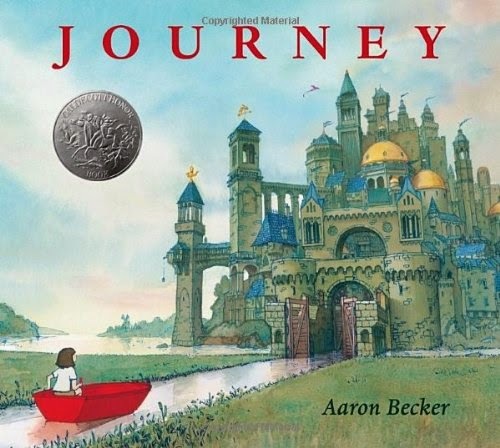 A recent Caldecott Honor book, Journey is like an elaborate version of Harold and the purple crayon. I this story, the protagonist is a little girl, who after failing to gain the attention of her father, mother and older sister, draws a red door on her bedroom wall, opens it and disappears into an enchanted forest. As interesting as this alternate universe is, it seems the young heroine is still alone in her adventure as she must draw herself out of close encounters with a series of mysterious villains. But eventually, by showing kindness to another creature in distress, she finds a kindred spirit with a magic crayon of his own. After I read this one with Stephen, I decided to page through it again. The illustrations are truly magical. 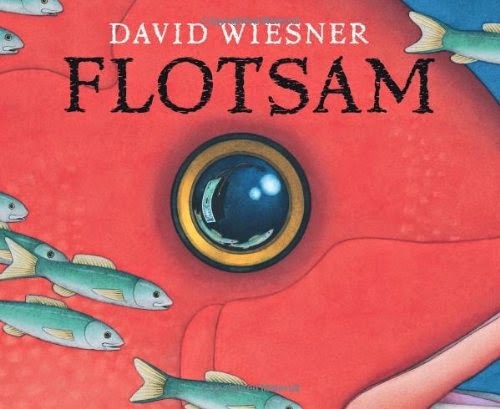 Another great library find, Flotsam, chronicles the mysteries of an underwater fantasy world through the snapshots-- presumably taken by sea creatures-- from a camera that washes up on shore into a little child's hands. Many of the scenes appear to depict the "normal" wonders of the ocean floor at first glance. But a closer observation reveals interesting antics and characters. Both my older boys are fond of the beach and sea creatures, so this was a hit with them. 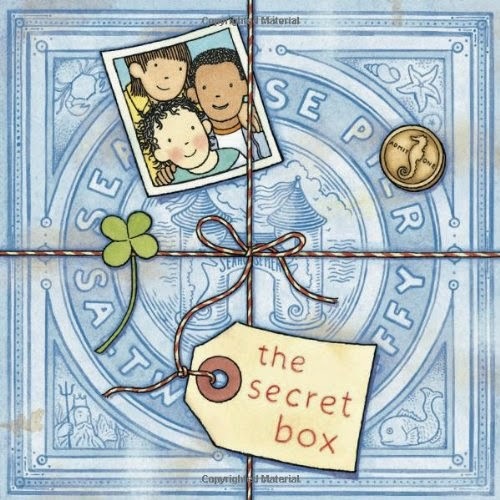 Another wordless story based on mysterious photographs, The Secret Box transforms a box of old-timey snapshots hidden in an attic into a treasure hunt for the carefree fun of a carnival from another era. The friends that piece together the clues from the photos and memorabilia in the box eventually bring the story full circle, contributing their own images for another group of children to discover in the next generation. I enjoyed this the open-endedness of this cartoon-styled narrative, but the boys didn't get into it as much... perhaps the subtle twist at the end was lost on their five- and three-year-old minds. A wordless cartoon told in several chapters, Faller's picture book follows the whimsical dog, Polo, as he climbs strings to outer space, joins a band of monkeys in their tree-top soiree, sails to a deserted volcanic island and roasts his dinner over a lava flow, and slides down rabbit-holes to the middle of the earth where glowing pea-like beings march around luminary mushrooms. Polo makes plenty of silly friends and does many nonsensical things. 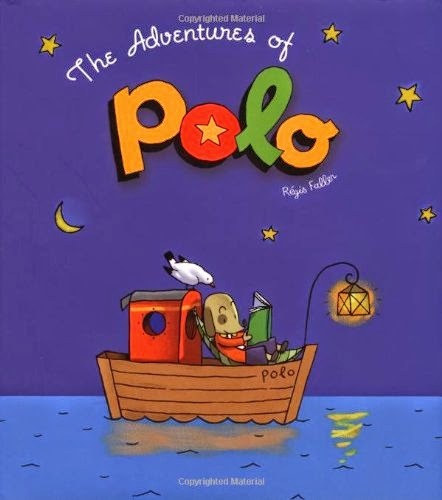 There's not really a moralistic take-away here, but The Adventures of Polo is just plain fun. Stephen loves to narrate Polo, and this book has been great for long and far less adventurous drives from Kentucky to Illinois and Ohio. 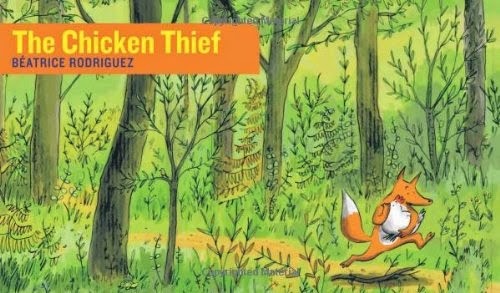 The Chicken Thief by Beatrice Rodriguez (first installment to trilogy including Fox and Hen Together and Rooster's Revenge) A fox stakes out the home of some woodland friends, then bursts from the bushes and snatches up a chicken, much to Rooster, Bear and Rabbit's dismay. The chase is on, and Rodriguez tells the story through breathtaking panoramas over hills, into mountains and through valleys, owing much to the book's unusual 6 x 10-inch dimensions. **Spoiler Alert** At the end of this wordless tale, the foxy villain turns out to have had a change of heart (or perhaps purer intentions all along?) for taking Miss Hen, as the pair are eventually discovered sipping cocoa by a cottage fire and invite their "guests" in to join them. I'm ambivalent about the story's twist. Perhaps it is a testimony to the happiness many culturally-crossed couples find despite their families' best attempts to thwart the union? As the product of a mixed-race marriage myself, I'm hard-pressed to dislike this message. However, the fact that the chicken didn't seem to be aware of the romance before being whisked away kind of taints that interpretation. There's nothing cute about stalking, kidnapping and imprisoning your crush until she loves you back. I'm probably over-thinking this. Whether or not you take umbrage to the moral of the story, the beautiful illustrations are worth a look at this wordless book. And the fact that there's no words means you can interpret it however innocently as you please. While the premise of this book is really quite odd, Stephen really liked this and another porcine picture book by Geisert. In this tale, smaller-than-life pigs struggle to survive against the imminent danger of a sputtering volcano, which sends down ash and embers on their quaint village and sets their thatched roofs ablaze... what's not to like about that? The pigs escape the inferno by some crafty maneuvering and botanical knowledge. 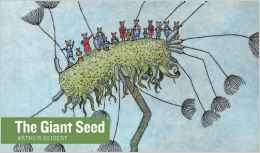 Like The Chicken Thief, The Giant Seed is part of the Stories Without Words series and features the lovely panoramic pages. Reflections on "Animal, Vegetable, Miracle"